Most of us have good intentions to keep up our fitness and exercise routines while we’re away but let’s face it… you’re on vacation! It's an escape from work, stress, and… exercise. Or maybe you’re traveling for work so it’s not your escape – but it’s also not an excuse to skip your workout. 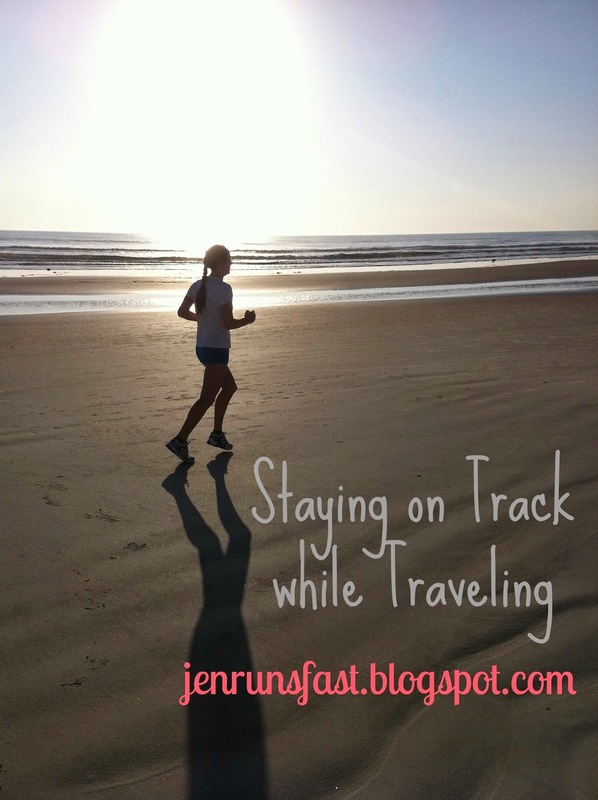 Leave the running shoes at home and you can skip the rest of this blog post! Wear sneakers on the plane to allow extra room in your suitcase for some running clothes and GPS watch. Incorporate exercise into your itinerary. I’m a planner. If it’s not on the schedule, chances are it’s not going to get done. Also, don’t beat yourself up if you miss a day or two. Unexpected travel delays, jetlag, and other events may interfere with your plans. Just get back on track and plan activities for the next day. Set your alarm and start your day with a workout. While you’re heading to a business conference, sightseeing venture, or even better—laying by the pool sipping margaritas, you won’t have to worry about when you can squeeze in your run. Not only will it save you the taxi or subway fees, you will be getting a free walking tour of the city! Long layover at the airport? Walk the terminals. Have a few extra minutes in between business meetings? Walk a few blocks to find a new coffee shop. Going to Vegas? There are awesome hiking trails just outside of the city. Weekend in New York City? You have no excuses with the accessibility and great paths through Central Park or take a waterfront route along the Hudson River. Business trip to Chicago? Chicago’s Lakefront Trail runs 18 miles along Lake Michigan. Visiting Cape Cod? Rent bikes and take the Rail Trail to the National Seashore. Spending a week at the beach? Places like Florida’s Daytona Beach or Surfside Beach in Texas have miles and miles of packed sand perfect for running and walking. Beat the heat and wake up early for an unforgettable sunrise adventure. On websites like active.com, you can search for dates and locations of all local road races. Sign up in advance to guarantee you’ll be getting in at least one run during your trip! You can also try visiting the local running store to see if they have any group training runs scheduled. If your excuses are “it’s too cold” or “it’s too hot” or “it’s dark out,” check out the hotel fitness center. Most are open 24 hours. Leave your excuses at the door and hop on the treadmill or elliptical to log some active minutes. We are all going to eat different foods on vacation. It’s inevitable. It takes a lot of effort to find healthy options at the airport and once you get to your hotel or the beach, it’s time for a drink followed by big meals and delicious desserts. It’s ok to splurge and "treat yo self" as long as you are splurging in moderation! Pack your favorite healthy option snacks for those hours waiting at the airport. Crackers, nuts, protein bar, energy chews, etc. Save money and better food choices. It’s a win-win. Once you arrive at your destination, hit up the grocery store for a case of water, fruit, yogurt, and other essentials. If healthy food is around, you are much more likely to grab it before heading to Starbucks and picking up a chocolate croissant to go with your morning latte. Hydrate! & Have a great trip! !